Great Britain is in the top 10% of areas for harbouring alien species, according to a study. 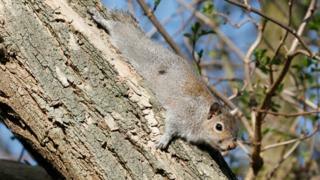 Animals that have moved in from afar include the grey squirrel, rose-ringed parakeet and the noble false widow spider. The UK also has more established alien plants than elsewhere in Europe, such as Himalayan balsam. Scientists say islands and mainland coastal regions are global "hotspots" for alien species. They are calling for more effective measures to stop further introductions of plants and animals into vulnerable ecosystems. "We need to be much better at trying to prevent the introduction of species that can be harmful in the first place," said Dr Wayne Dawson of Durham University, UK. "Prevention is better than cure with invasive species." Alien species are plants or animals that are non-native (or alien) to an ecosystem and whose introduction is likely to cause harm. International researchers studied data on eight groups of plants and animals across 186 island and 423 mainland regions. Islands and mainland coastal regions are thought to have higher numbers of established alien plants and animals because they contain major points of entry such as ports. These areas should be a focus for preventing further introductions of alien species, say scientists. Measures include stepping up biosecurity measures at entry points to detect stowaway species and careful vetting of species proposed for introduction to an area. The research is published in the journal, Nature Ecology & Evolution.